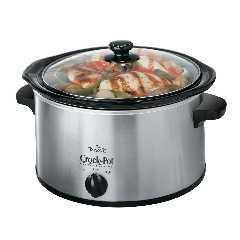 ← Throw yo hands in the aya. .
Who doesn’t like their crock pot? I am cooking dinner in mine right now and really excited to taste the new recipe I am trying. I posted about some crock pot recipe before and got several comments about always looking for new crock pot recipes. Well, have I got a blog for you!! There is a woman who has committed to use her crock pot EVERY DAY in 2008! That’s more than liking your crock pot, for sure! I read about her on Rocks in my Dryer (the writer of which I have added to the mythical dinner table of “if I could have dinner with anyone” fame) and when I linked to the blog, appropriately titled “A Year of Crockpotting“, I got a bit giddy. Take a look yourself and let me know if you try anything! I will have to check it out. I love my crockpot, but don’t have too many recipes I use it for. I got a new one a couple of years ago and it just seems to cook a lot hotter than my old one. Let me know if you find any great recipes. That is so funny. Not only do I read her blog, and always get a good laugh, but I have been meaning to put a post about it on my blog. You know what they say….great minds think alike.